I was reading an article FC Barcelona posted on their twitter account (https://www.fcbarcelona.com/football/first-team/news/2017-2018/barca-valverde-style-fcbarcelona) on how they've been playing recently under Valverde. Barcelona are lining up in their typical 4-3-3 or 4-1-2-2-1 with Messi given more of a free role through the middle with Deulofeu and more recently Dembele playing more on the right than on the left. The wingbacks, in this case, Jordi Alba and Nelson Semedo are running up and down the flanks giving the team some width. Sergio Busquets keeps his deep position on attack and on defence he slots in between the two centrebacks, Andres Iniesta still pulls the strings in the midfield with Ivan Rakitic providing more of an attacking support while still being solid on defence. On defence they have Gerard Pique and Samuel Umtiti playing an extremely high line wich sometimes goes over the halfway line. They are also pressing relentlessly to recover possesion as quickly as possible. Will update after I finish pre-season with some more screenshots and how the team got on in terms of results and actually playing the way I want them to play. Any criticism is appreciated!! Cheers! P.S. This is my first analysis/go at a tactical recreation if anything is out of place or needs more info feel free to tell me. 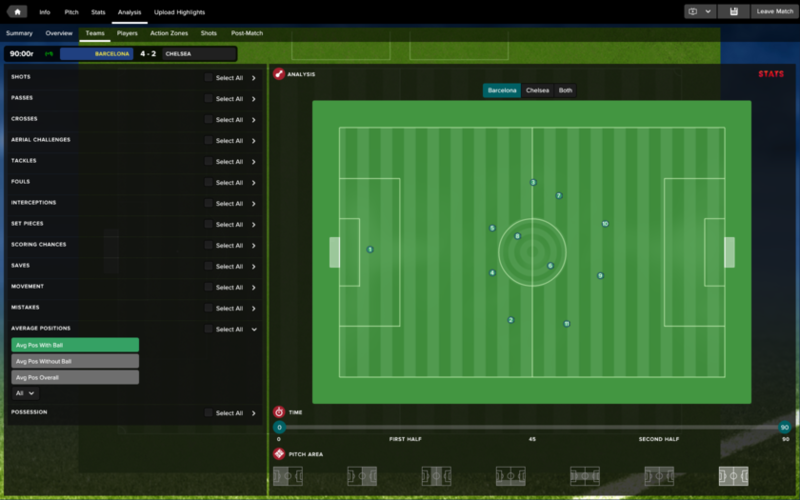 I am trying to create a similar tactic but without a striker. 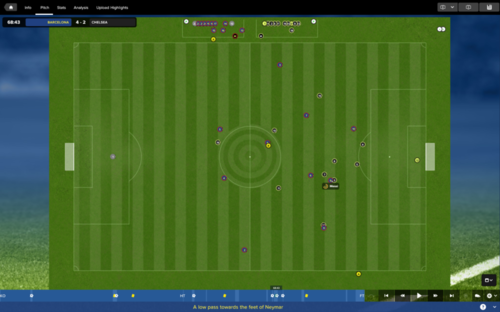 High press is not easy to get right in fm17, press to much and to high and you get caught in behind. If it was easy in real life errybody would be doing it. I think Barca under Valverde is really interesting ! I think he did a great job so far without Neymar ! When i saw them play, against Sociedad i think, the most interesting thing for me was, that they defended in a 4-4-2. Great link and a very nice read. A few tweaks to the player individual instructions. what formation do you use ? Same one as described in cleons write up. I am going to experiment with a 3421 and 4132 at some point. Also going to try a 433 with a slightly more attacking work up on the cleon theory. This was the average position with the ball in a pre-season match against our B team. I think it looks pretty similar to the one against Juve and also came up with a decent 3-0 result. The stats were lopsided as you can see below the only concerning factor that game was only 7 of 21 shots were on target and the possession stat was also looking a bit low for my liking. We actually dominated Bayern the whole game and I actually liked Messi dropping a bit deeper because it cause for their centrebacks to mark him and opened up holes which the team exploited. I played to a draw against Monaco because I was testing out another tactic and then beat Leverkusen 4-1 with the same tactic so I won't post those results. We also played Man City in Iniesta's testimonial and beat them 4-1 with another 4-3-3 tactic. Can you post the screenshots? Can you post more screenshots? 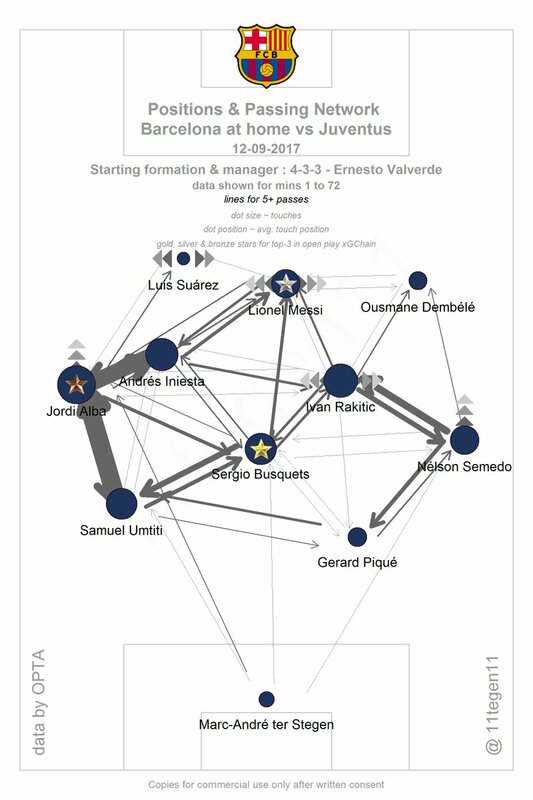 The most important thing in Valverde's Barcelona is he is using a 442 invariably (most of the times flat, sometimes diamond). What is sure is 433 is part of the past. I wouldn't count Deulofeu and Dembele as starters. Back four and gk is quite easy. Jordi Alba fb(at). Wb(at) would be another option. It's a very important role IMO. Barça tries to créate overloads in the right flank while Jordi Alba runs into the space created on the left. Typical play Messi pass to Alba. In midfield problems arise. We have a doublé pivot, Rakitic Busquets. I've observed how when defending, Busquets starts pressing higher up the pitch tan Rakitic, while when attacking Busquets is slightly deeper, except when bringing the ball from the defense. In that case Rakitic comes Deep to get the ball like a playmaker. When Rakitic or Busquets are not playing, Paulinho plays an attacking role in the center of the midfield, making very aggressive forward runs. In the right flank, most used player can perfectly be Paulinho but also Gomes and sometimes Deulofeu, Vidal or Dembele. With the last 3, it's a very simple winger role. With Paulinho or Gomes, it's a quite strange role I couldn't name. Someone who starts wide but moves centrally to link with Messi. The fact is Dembele has been injured so probably I would place him there with a winger role. Things get even more interesting when Valverde player a diamond midfield, for instance, against Real Madrid. We had Busquets as a lone pivot in front of the defense, protected by Rakitic and Iniesta on the flanks and Paulinho in front of them. The role of Paulinho was very obvious that day: SS(at), while Iniesta could be described as a mix of a WP, AP and Mezzala. Rakitic plays a more industrious role, perhaps a simple cm(su) with some PIs (tackle harder, close down more, perhaps). Upfront is also quite easy. Messi with a free role (trequartista, false 9) and Suarez as the spearhead of the attack (AF). The paulinho role is very interesting and to be honest if you look at how he played in some matches, most notably the real madrid win recently, he was very easily one of their main attacking threats. A lot of times, he often moved up to be a centre forward and combined very well with messi to torment sergio ramos and could have scored a goal in that match. I would say he would be a good example of a raumdeuter in the MR position because he hardly dribbles, he hardly crosses, he hardly cuts inside but he stays narrow often so i think roam with sit narrower and cross less often would be perfect for him. Sergi Roberto and Semedo also attack from the right, slightly less so than Alba. So I would say WB-S (DR) and WB-A (DL). False 9 is not a free role as it doesn't have Roaming as default instruction. Trequatista and Complete Forward have Roaming by default. Normally the 442 is with flat midfield. But vs Real M, it was a 4132 with two Mezzala's (S) and CM-A. Busquets as DLP-D. I'm more excited to see when Coutinho and Dembele start playing in the lineup regularly. I'm not sure the Frenchman is a Winger. He doesn't go wide and to the byline to cross balls. He cuts and roams inside. I would say more of a IW to me from the very few games he has played. I only see Coutinho playing on the left wing as a WP, in the Iniesta role. Perhaps if Messi is not there, he could play behind Suarez. I struggle to see how Dembele, Coutinho, Iniesta and Suarez wil play together. Ter Stegen - Roberto, Alba, Pique, Umtiti - Busquets, Rakitic, Dembele, Coutinho - Messi and Suarez. In CL games, Iniesta will play instead of Phil. And I think the club will be more cautious with Dembele coming back from his second injury, so I expect to see more of Paulinho, Andre Gomes and Vidal. 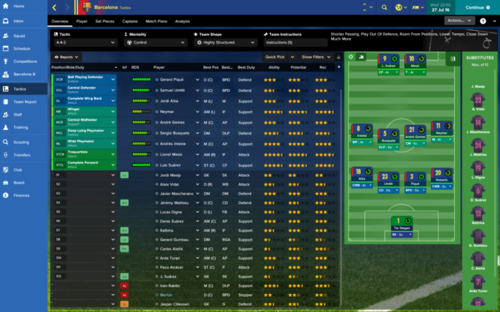 IRL Valverde has Barca playing variations of the 442 arguably, but in FM I'm not big fan of replicating it that way. I don't like how Messi plays as Striker in a 442 (on FM). I've found that he plays more like IRL if used in AMC position as SS with Roaming PI. I'm currently switching between 4231 and 4411 formations. Its going to be tough to replicate his strategy, cos the system changes like 5 times in a game, they use like 5 different tactics with some crazy movement in it..one moment they have a 2 man attack, the next its a solo striker..etc. They do not play a 442, in fact its a very sophisticated system. I think it's fair to say they play 4-4-2 and 4-4-2 diamond/4-3-1-2. The animation above shows different shapes but you could do similar for almost any system - something as simple as a fullback overlapping a winger/wide midfielder could change a 4-4-2 to 3-5-2, for instance. Busquets' halfback (in FM terms) movement is the most notable in my opinion, but not particularly unique. I agree. There are a lot of moving parts and variations. But the defensive shape often is close to 442/4411. And as we know the formation is the defensive shape in FM terms. The X factor is again Messi's role. Even under Luis Enrique, Barca defended in somewhat 442 shape while attacking wise it was 433. Messi's age and Suarez's presence are the reasons for the deviation from the traditional 433 previously used. But I think it makes Barca more dangerous and unpredictable now. 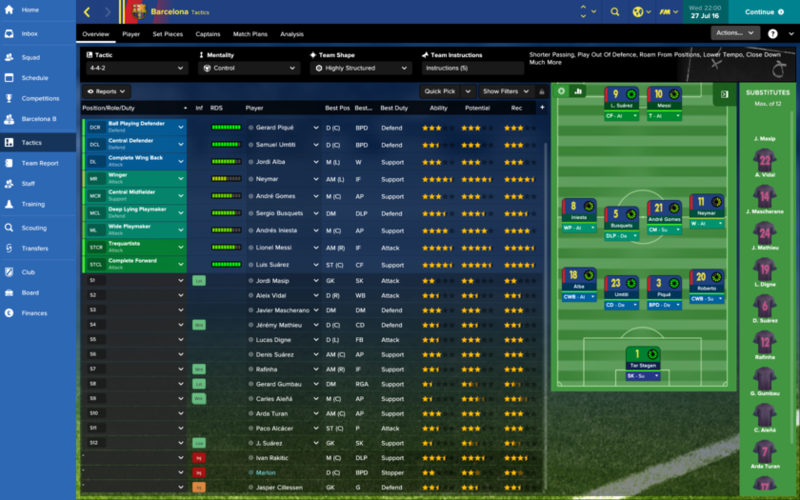 And even harder to replicate on FM. I would be interested to see your try to do it. Okay so I've been MIA for a couple months. Been trying to get this to work for quite some time and I came up with a system that does about what I want it to do.